If Hatzolah EMS volunteers can't find you, they can't help you. Four minutes is the amount of time EMS personnel have to provide emergency care to someone who has stopped breathing, before irreversible brain damage begins. Every second counts and is crucial. Having visible house numbers can be the difference between life, or CH"V death. There is a famous quote from a Hatzolah member in which he says that he was responding to an emergency call and the only way he was able to find the house was from the numbers on the garbage can. This case and similar ones are unfortunately very common. Go outside and cross the street. Can you see your house numbers? Do this again at night. Can you see them now? Walk across the street of the houses next door to you, can you see your house numbers? If the answer to any of these questions is no, read and follow the suggestions below. ...visible house numbers save lives! 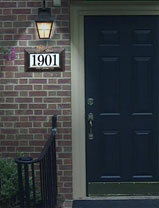 Your house numbers should be clearly visible from the street, and well lit at night. They should not be blocked by any trees or bushes. They should be either light numbers on a dark background, or dark numbers on a light background. The numbers should be large enough to be seen easily from across the street. Numbers should be well-lit at night. This can be accomplished by having a light above or below the numbers or with lit numbers that are wired or plugged in. We can not recommend solar powered numbers, due to their high rate of failure. Use actual numerals; do not have the number spelled out in script. Script numbers are hard to see and take time to read. By the time the Emergency Personnel can make out what they say, they may already have passed your house, and will have to go around the block, wasting precious moments. Encourage your neighbors and friends to have visible house numbers. If we can see their numbers as we are driving down the block, it makes it easier for us to find you. Very good suggestions on house numbers from a website called TipThePizzaGuy.com . Pizza deliverers also have problems finding houses when the house numbers are not visible.